Also see the pediatrics article, Cockayne Syndrome. 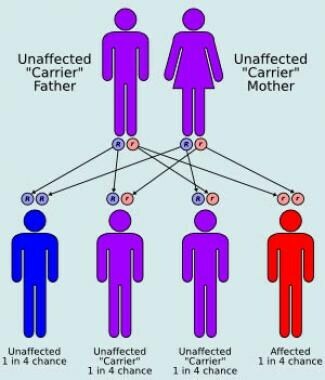 Cockayne syndrome is an autosomal recessive disorder. A DNA repair defect is a prominent feature of Cockayne syndrome. Cells with a defective DNA repair mechanism are sensitive to UV light. Decreased DNA and RNA synthesis, increased sister chromatid exchanges, and increased chromosomal breaks may occur. Cockayne syndrome is rare worldwide. No racial predilection is reported for Cockayne syndrome. No sexual predilection is described for Cockayne syndrome; the male-to-female ratio is equal. Cockayne syndrome I (CS-A) manifests in childhood. Cockayne syndrome II (CS-B) manifests at birth or in infancy, and it has a worse prognosis. Patients with Cockayne syndrome I have progressive, unremitting, neurologic deterioration usually leading to death by the second or third decade of life. Patients with Cockayne syndrome II typically have a worse prognosis, with death occurring earlier, typically by age 6 or 7 years. A genetic counselor should educate the parents of the Cockayne syndrome patient. Cockayne EA. Dwarfism with retinal atrophy and deafness. Arch Dis Child. 1936. 11:1-8. Natale V. A comprehensive description of the severity groups in Cockayne syndrome. Am J Med Genet A. 2011 May. 155A(5):1081-95. [Medline]. Wilson BT, Stark Z, Sutton RE, Danda S, Ekbote AV, Elsayed SM, et al. The Cockayne Syndrome Natural History (CoSyNH) study: clinical findings in 102 individuals and recommendations for care. Genet Med. 2016 May. 18 (5):483-93. [Medline]. Chu G, Mayne L. Xeroderma pigmentosum, Cockayne syndrome and trichothiodystrophy: do the genes explain the diseases?. Trends Genet. 1996 May. 12(5):187-92. [Medline]. Kraemer KH, Patronas NJ, Schiffmann R, Brooks BP, Tamura D, DiGiovanna JJ. Xeroderma pigmentosum, trichothiodystrophy and Cockayne syndrome: a complex genotype-phenotype relationship. Neuroscience. 2007 Apr 14. 145(4):1388-96. [Medline]. [Full Text]. Ridley AJ, Colley J, Wynford-Thomas D, Jones CJ. Characterisation of novel mutations in Cockayne syndrome type A and xeroderma pigmentosum group C subjects. J Hum Genet. 2005. 50(3):151-4. [Medline]. Hayashi M, Miwa-Saito N, Tanuma N, Kubota M. Brain vascular changes in Cockayne syndrome. Neuropathology. 2011 Jul 12. [Medline]. Zhang WR, Garrett GL, Cleaver JE, Arron ST. Absence of skin cancer in the DNA repair-deficient disease Cockayne Syndrome (CS): A survey study. J Am Acad Dermatol. 2016 Jun. 74 (6):1270-2. [Medline]. Scheibye-Knudsen M, Tseng A, Borch Jensen M, Scheibye-Alsing K, Fang EF, Iyama T, et al. Cockayne syndrome group A and B proteins converge on transcription-linked resolution of non-B DNA. Proc Natl Acad Sci U S A. 2016 Nov 1. 113 (44):12502-12507. [Medline]. [Full Text]. Henning KA, Li L, Iyer N, et al. The Cockayne syndrome group A gene encodes a WD repeat protein that interacts with CSB protein and a subunit of RNA polymerase II TFIIH. Cell. 1995 Aug 25. 82(4):555-64. [Medline]. Laugel V. Cockayne syndrome: the expanding clinical and mutational spectrum. Mech Ageing Dev. 2013 May-Jun. 134(5-6):161-70. [Medline]. Calmels N, Botta E, Jia N, Fawcett H, Nardo T, Nakazawa Y, et al. Functional and clinical relevance of novel mutations in a large cohort of patients with Cockayne syndrome. J Med Genet. 2018 Mar 23. [Medline]. Kleppa L, Kanavin OJ, Klungland A, Stromme P. A novel splice site mutation in the Cockayne syndrome group A gene in two siblings with Cockayne syndrome. Neuroscience. 2007 Apr 14. 145(4):1397-406. [Medline]. Cleaver JE, Hefner E, Laposa RR, Karentz D, Marti T. Cockayne syndrome exhibits dysregulation of p21 and other gene products that may be independent of transcription-coupled repair. Neuroscience. 2007 Apr 14. 145(4):1300-8. [Medline]. Christiansen M, Thorslund T, Jochimsen B, Bohr VA, Stevnsner T. The Cockayne syndrome group B protein is a functional dimer. FEBS J. 2005 Sep. 272(17):4306-14. [Medline]. Frouin E, Laugel V, Durand M, Dollfus H, Lipsker D. Dermatologic findings in 16 patients with Cockayne syndrome and cerebro-oculo-facial-skeletal syndrome. JAMA Dermatol. 2013 Dec. 149(12):1414-8. [Medline]. Wu Y, Zheng Y, Yan X, Huang Y, Jiang Y, Li H. Ocular findings in a patient with Cockayne syndrome with two mutations in the ERCC6 gene. Ophthalmic Genet. 2016 May 17. 1-3. [Medline]. Bhojwani R, Lloyd IC, Alam S, Ashworth J. Blepharokeratoconjunctivitis in Cockayne syndrome. J Pediatr Ophthalmol Strabismus. 2009 May-Jun. 46(3):184-5. [Medline]. Nardo T, Oneda R, Spivak G, et al. A UV-sensitive syndrome patient with a specific CSA mutation reveals separable roles for CSA in response to UV and oxidative DNA damage. Proc Natl Acad Sci U S A. 2009 Apr 14. 106(15):6209-14. [Medline]. [Full Text]. Tan WH, Baris H, Robson CD, Kimonis VE. Cockayne syndrome: the developing phenotype. Am J Med Genet A. 2005 Jun 1. 135(2):214-6. [Medline]. Wilson BT, Strong A, O'Kelly S, Munkley J, Stark Z. Metronidazole Toxicity in Cockayne Syndrome: A Case Series. Pediatrics. 2015 Sep. 136 (3):e706-8. [Medline]. Morris DP, Alian W, Maessen H, et al. Cochlear implantation in Cockayne syndrome: our experience of two cases with different outcomes. Laryngoscope. 2007 May. 117(5):939-43. [Medline]. Van Wyhe RD, Emery CV, Williamson RA. Cochlear implantation in pediatric patients with Cockayne Syndrome. Int J Pediatr Otorhinolaryngol. 2018 Mar. 106:64-67. [Medline]. Wooldridge WJ, Dearlove OR, Khan AA. Anaesthesia for Cockayne syndrome. Three case reports. Anaesthesia. 1996 May. 51(5):478-81. [Medline]. Yuen MK, Rodrigo MR, Law Min JC, Tong CK. Myocardial ischemia and delayed recovery after anesthesia in a patient with Cockayne syndrome: a case report. J Oral Maxillofac Surg. 2001 Dec. 59(12):1488-91. [Medline]. Raghavendran S, Brown KA, Buu N. Perioperative management of patients with Cockayne syndrome - recognition of accelerated aging with growth arrest. Paediatr Anaesth. 2008 Apr. 18(4):360-1. [Medline]. Hurwitz S. Clinical Pediatric Dermatology: A Textbook of Skin Disorders of Childhood and Adolescence. 2nd ed. Philadelphia, Pa: WB Saunders; 1993. 96. Spitz JL. Genodermatoses. Baltimore, Md: Williams & Wilkins; 1996. Vol 1: 208-9. Sybert VP. Genetic Skin Disorders. 1st ed. New York, NY: Oxford University Press; 1997. Vol 1: 559-61.